1957 Cissy No. 2170 in soft white etherial bride, a vision of layered nylon tulle and a double satin train, chapel length veil with its coronet of flowers. 1959 Elise No. 1835 in a cloud of pleated nylon tulle, layers of lace and billowing veil with its coronet of flowers. The brides of the 1950s and early 1960s were an excuse to be just a little theatrical... well, maybe a lot theatrical for these romantic and majestic events. Make them pink, white, ecru and the bridesmaids in all kinds of soft pastel shades. Wear a tiara — after all, there were a number of royal brides this decade - Grace Kelly became royal because of her wedding. Maybe your role model was Elizabeth Taylor or a more debutante Jacqueline Kennedy. Two things that you could count on in the mid century Madame Alexander dolls — brides and ballerina's. Every season brought these iconic choices during a period of women's rather limited career choices. The baby boom was on, and mothers were needed in the home, tending to the family. That was then — now it's much more exciting with limitless options. What's old is new again — the wedding experience is bigger than ever. Royal weddings, weddings on reality shows and shows just about weddings have all added to this American tradition. Of course, the bride is the centerpiece of this event, and what she wears sets the tone for her bridesmaids, flowers, decorations and the wedding cake. While contemporary weddings are often a symbol of love and commitment between the bride and the groom, for most of history, weddings were more like a business deal in which two families joined forces for a beneficial arrangement or alliance. Wedding dresses, then, were chosen to present the bride’s family in the best light, especially in terms of wealth and social status. 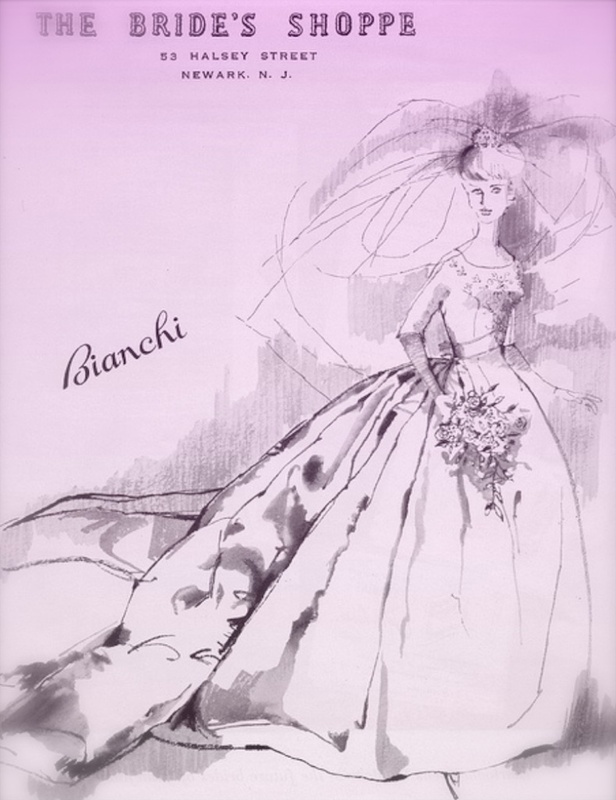 For most of history, brides rarely purchased a dress specifically for their wedding day. The bride would typically wear her finest dress to the ceremony, even if it was a dark color. In fact, many brides wore black during this time. Vintage 1963 bridal ad with a double satin train and tiara - the grand theater of the mid century bride encouraged the bride to embrace the moment, live the dream and pay for it all with credit. Cissy is wearing, what was called in the 1950s, a Chapel Length veil — shorter in the front and longer in the back. Now, it would be referred to as fingertip length. Elise is wearing a floor length, or Cathedral Length veil that drapes to the floor — with its element of romance and theater. This length veil is particularly alluring when arranged around the bride.